Often described as a combination of hockey, soccer and basketball, the sport of lacrosse is the oldest North American team sport. It was first played by numerous Native American tribes as a preparation for war and was later modernized by European immigrants. Upon the colonization of North America, the sport began to grow and is now the fastest growing sport in the world. The number of active lacrosse participants has grown an average of 15% per year in each of the past seven years. French missionaries are credited with giving the sport its name. These missionaries thought that the stick used by the Native Americans resembled a bishop’s crosier, or “le crosse." Over many years, lacrosse has evolved from a Native American war game to a competitive sport, and is still undergoing change today. In its earliest form, the game had many purposes. It was played as a tribute to the gods to heal the sick (each game started with the players holding their sticks up in the air and shouting out to get the attention of the gods. ), to develop strong men, and to resolve conflicts. 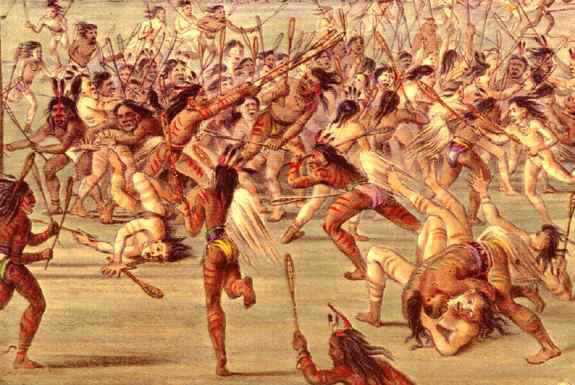 Sometimes, lacrosse was played as a friendly way to resolve a conflict within a tribe; other times, it was used as a war game to solve disputes between tribes. The game was played on a field from one to fifteen miles in length with no sidelines and sometimes lasted for days. Some tribes used a tree or rock as the goal (the ball had to hit this object) and others used two trees or poles that the ball had to pass between. Generally, the ball was made of wood, deerskin or stone. Teams had as many as 1000 players and each player used a wooden stick with a net on the end to move the ball. The basic rule was that the ball must never touch one’s hand. There is not much information on the early forms of lacrosse as most of the equipment was made of wood and has since decayed, but what is left shows three distinct forms of early lacrosse: the Southeastern, the Great Lakes, and the Iroquoian. 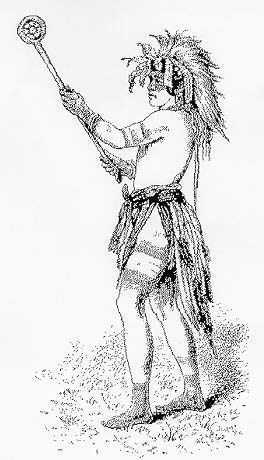 The Southeastern tribes, including the Cherokee, Choctaw, Chickasaw, Creek, Seminole, and Yuchi, used a two and a half foot spoon-like stick in each hand and cupped a small deer-skin ball between them. The Great Lakes tribes, including the Ojibwe, Menominee, Potawatomi, Sauk, Fox, Miami, Winnebago, and Santee Dakota, used a single three foot stick. The game was played with a wooden ball about three inches in diameter that was carried in a pocket of approximately the same size on the end of the stick. The third form of lacrosse, that of the Iroquoian and New England tribes, is the most similar to today’s sport. The stick was the longest of the three (usually more than three feet) and “is characterized by its shaft ending in a sort of crook and a large, flat triangular surface of webbing extending as much as two-thirds the length of the stick. Where the outermost string meets the shaft, it forms the pocket of the stick." 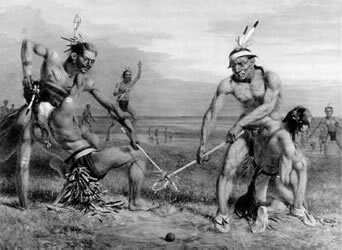 Lacrosse was played this way for countless years and only began to change upon the arrival of European settlers. French Missionaries are credited with being the first to document the sport of lacrosse. In 1636, a Jesuit missionary by the name of Jean de Brebeuf, recorded a Huron lacrosse game in an area that is now southeast Ontario, Canada. The game was examined and adopted, and by the 1800’s, a large number of French pioneers were avidly playing the game. The game continued to rapidly change and evolve. In 1856 the Montreal Lacrosse Club was founded with the first ever set of written lacrosse rules. The field size was limited to a maximum 880yds and limited the number of players on each to 10. Hundreds of players on each side were too hard to keep track of and officiate. The father of modern day lacrosse is a Canadian dentist by the name of George Beers. In 1867 he “revised the rules and it was his set of rules that was adopted by the National Lacrosse Association of Canada." The game quickly grew in popularity in Canada and became so popular that it was eventually named the national sport (that’s right, not hockey). As a result of the spread of lacrosse from the Montreal area, the Great Lakes version of lacrosse had died out by 1950 but the Iroquois and Southeastern tribes still continue to play. The Native American tribes began to use new equipment that came about with the changing technology. Shafts made of primarily aluminum (and more expensive ones made with titanium or other metals and alloys) are preferred, and separate plastic heads are being used. In fact, the descendents of the Mohawk tribe have started commercially producing plastic lacrosse heads. Their company name is Mohawk International Lacrosse and their slogan is, quite appropriately, “Home of the best Lacrosse Sticks Made from the people that invented the game.” However, they stay true to their roots and also produce the one-piece wooden sticks that were used by the Native Americans.